The Gulf of Mexico Alliance (GOMA) has instituted a collaborative partnership among the Gulf States to enhance the ecological and economic health of the Gulf of Mexico. The Habitat Conservation and Restoration Team (HCRT), established under GOMA, has recognized that sediment resources are integral to and a critical resource necessary in accomplishing many of the GOMA conservation and restoration initiatives and objectives. 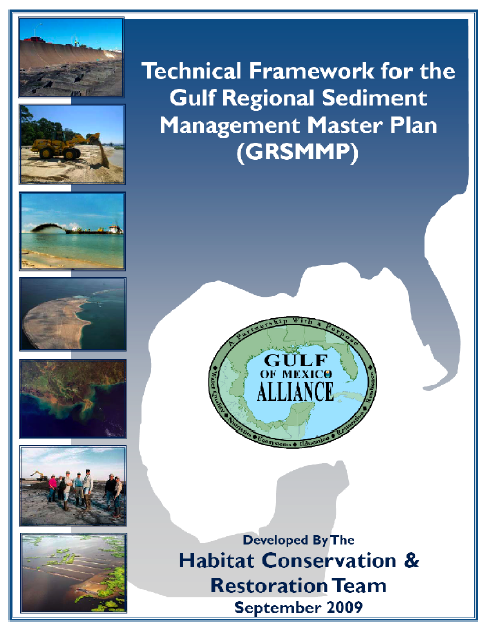 The Gulf Regional Sediment Management Master Plan (GRSMMP) was initiated as a result for managing this valuable resource and verifies the need for a comprehensive understanding of regional sediment systems and processes. This plan will provide guidelines using the understanding of sediment dynamics (inputs, outputs, movement) to manage sediment resources towards accomplishing environmental restoration, conservation, and preservation while enhancing abilities to make informed, cooperative management decisions. understanding of regional sediment systems and processes.